Western blot analysis of extracts from HeLa cells 48 hours following mock transfection, transfection with non-targeted (control) siRNA or transfection with Caspase-3 siRNA (100 nM). Caspase-3 was detected using Caspase-3 Rabbit Monoclonal Antibody #9665, and p42 MAPK was detected using p42 MAPK Antibody #9108. CST recommends transfection with 100 nM Caspase-3 siRNA. Decreased Caspase-3 expression was observed 24-72 hours post-transfection. 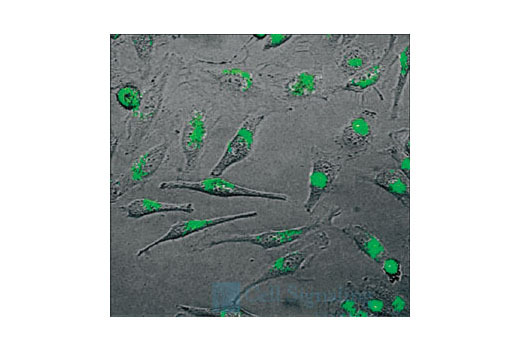 See Protocol for transfection procedure. 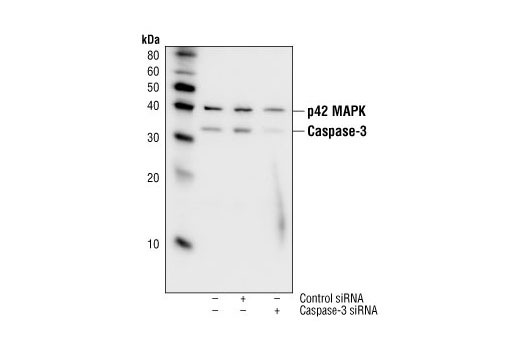 SignalSilence® Caspase-3 siRNA allows the researcher to specifically inhibit Caspase-3 expression using RNA interference, a method in which gene expression can be selectively silenced through the delivery of double stranded RNA molecules into the cell. All SignalSilence® siRNA products from CST are rigorously tested in-house and have been shown to reduce protein expression in specified cell lines. In addition to its central role in apoptosis, Caspase-3 has been shown to play a role in erythroid differentiation through the use of RNA interference (3). Carlile, G.W. et al. (2004) Blood 103, 4310-6.